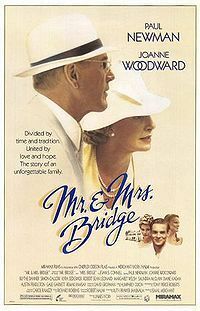 Mr. & Mrs. Bridge is a 1990 Merchant Ivory Film based on the novels by Evan S. Connell of the same name. It is directed by James Ivory, with a screenplay by Ruth Prawer Jhabvala and produced by Ismail Merchant. The film tells the story of a traditional family living in the Country Club District of Kansas City, Missouri, during the 1930s and 1940s. The Bridges grapple with changing mores and expectations. Mr. Bridge, played by Paul Newman, is a lawyer who resists his children's rebellion against the conservative values he holds dear. Mrs. Bridge, played by Joanne Woodward, labors to maintain a Pollyanna view of the world against her husband's emotional distance and her children's eagerness to adopt a world view more modern than her own. The movie features Blythe Danner as Mrs. Bridge's troubled friend, Simon Callow as a foreign psychiatrist the Bridges find unsavory, Saundra McClain as the Bridges' maid, and, as the Bridge children, Kyra Sedgwick, Robert Sean Leonard, and Margaret Welsh. It was filmed entirely on location in Kansas City, Paris, France, and Ottawa, Canada. It was nominated for the Academy Award for Best Actress (Joanne Woodward).